Starch is a versatile complex carbohydrate that forms an essential component of one’s daily diet. Starch is used in various products including in the manufacture of beverages (beer and whiskey), gypsum boards, textiles, cosmetics, in the paper industry, and as a stiffening agent (laundry starch). What are the Causes of Starch Poisoning? What are the Signs and Symptoms of Starch Poisoning? When large amounts of starch are swallowed, it can lead to sudden bowel obstruction and acute abdominal pain. How is First Aid administered for Starch Poisoning? Note: Generally, Cooking Starch Poisoning is a non-serious condition. With appropriate and adequate home care, the individual may recover completely, without any severe symptoms being noted. However, this may not be the case for Laundry Starch Poisoning. Who should administer First Aid for Starch Poisoning? 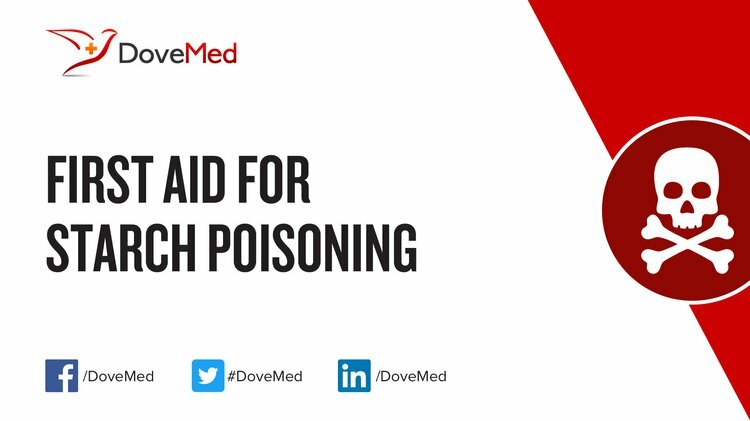 First aid for Starch Poisoning is administered by healthcare professionals. What is the Prognosis of Starch Poisoning? How can Starch Poisoning be Prevented? Marashi, S. M., Arefi, M., Behnoush, B., Nasrabad, M. G., & Nasrabadi, Z. N. (2011). Could hydroxyethyl starch be a therapeutic option in management of acute aluminum phosphide toxicity?. Medical hypotheses, 76(4), 596-598. Guinebretière, M. H., Auger, S., Galleron, N., Contzen, M., De Sarrau, B., De Buyser, M. L., ... & De Vos, P. (2013). Bacillus cytotoxicus sp. nov. is a novel thermotolerant species of the Bacillus cereus Group occasionally associated with food poisoning. International journal of systematic and evolutionary microbiology, 63(1), 31-40. Rumboldt, Z. (2015). Hydroxyethyl starch should not be used to manage severe aluminium phosphide poisoning. Arhiv za higijenu rada i toksikologiju, 66(3), 219-219. Nasri-Nasrabadi, Z., & Marashi, S. M. (2015). Response to Professor Rumboldt’s reaction to our letter on hydroxyethyl starch use in managing aluminium phosphide poisoning. Archives of Industrial Hygiene and Toxicology, 66(3), 221-223. Marashi, S. M., Nasrabadi, Z. N., Jafarzadeh, M., & Mohammadi, S. (2016). Hydroxyethyl starch could save a patient with acute aluminum phosphide poisoning. Acta Medica Iranica, 54(7), 475-478. Marashi, S. M. (2011). Hydroxyethyl Starch, Golden Remedy in Acute Aluminum Phosphide Poisoning Treatment: A Case Report. Mahdi Marashi, S., & Nasri-Nasrabadi, Z. (2015). Can sodium bicarbonate really help in treating metabolic acidosis caused by aluminium phosphide poisoning?. Arhiv za higijenu rada i toksikologiju, 66(1), 83-84.